For Strong Hop up & Long range Upgrade! ●CNC Enhanced Aluminum Alloy+ Designed for GBB M4 Series! Tokyo Marui GBB M4MWS is known for its stable accuracy, but with its original chamber hop arm, the Hop tends to be weak, and lacks performance for long distance shots. We redesigned the shape of the arm, to get better and stronger Hop up compared to its original Hop arm. It can also be adjusted to non-hop status, so it is compatible for both long and close distance. ※Please adjust the Hop Dial to Zero before installing. 1. 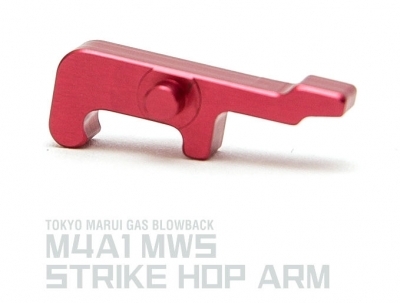 Please read the “11 Compensator attachment” on the Tokyo Marui instruction and take off the compensator. Next, please take off the Handguard in order of: RAS lower (MMG2-20) then RAS Upper (MMG2-19). 5. Take out the chamber from the outer barrel, and take off the O-ring closing the chamber. 6. 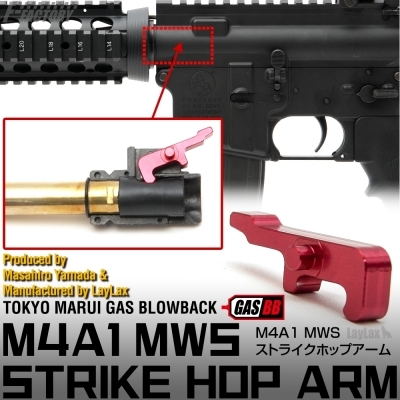 Exchange the Original HOP lever B (MGG2-27) with our “M4A1 MWS STRIKE HOP ARM.” Reverse the intrusion 1-6 to reassemble. ※Cushion rubber tube (MGG2-28) is not required.